I’ve seen a couple of these hang drums on the street now–usually near the BART stations. The sound it makes is a cross between a steel drum and gongs from the Philippines. I had to check it out for myself. Hang means “hand” in the Bernese language, and is pronounced “hung or hong”. The Hang was developed in Switzerland. It was the result of many years of research on the steelpan and the study of the diverse collection of instruments from around the world, such as Gongs, Gamelan, Ghatam, drums, bells, etc. The instrument is played with the hands. 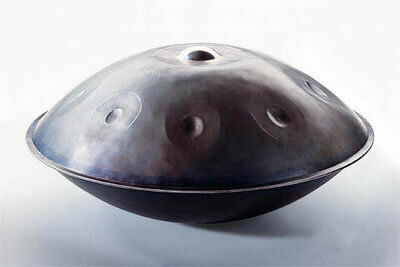 Udu-like sounds are produced with the air resonance, the sounds of the clamped shallow shells sound like bells or harmonically tuned steelpans. The inner note on the bottom dome is the bass note, and when played in a dampened way allows change in pitch like a talking drum. Seven to nine notes are tuned harmonically around a central deep note. The hemispheres are hardened by a process known as gas-nitriding. This is a thermal treatment process in which nascient hydrogen atoms diffuse into the steel and form nitride compounds with many of the alloys in the steel. I want one but I’ll have to wait. The price for one is about $500.